What if you’re the bully? Self-awareness and honest feedback can help you make a change. Bullying and incivility are prevalent in the nursing profession, so we each need to determine if and how we contribute to the problem. If you’ve recognized your behaviors may be considered bullying, make a commitment to yourself and your coworkers to get the help you need to adapt your behavior. IF NURSES around the world are talking about nurse bullies, we have to ask ourselves, “Who are the bullies?” The answer is that we are. We, nurses, are the bullies, or at least we have to consider that we might be. 60.4 million Americans report being affected by bullying in the workplace. 70% of perpetrators are reported to be male, and 60%of targets are female. 90% of new nurses report experiencing bullying from other nurses. Bullying can have physical and psychological consequences. 30% to 50% of stress-induced illnesses are reported to be caused by bullying behaviors. Research has connected fatigue, sleep disturbance, stomach ulcers, migraine headaches, GI issues, poor concentration, excessive worrying, depression, and posttraumatic stress disorder with bullying. Researchers found increased incidence of neck pain and type 2 diabetes among bullied employees. 43.5% reported the incident to a manager. Learn and practice conflict negotiation skills. Sources: ANA Enterprise 2018, Boivin 2018, Workplace Bullying Institute 2017. Why was Connie able to recognize her behavior based on the material presented during that workshop, but not before? Couldn’t she see how her repeated patterns of overt yelling, targeting employees she thought were weak, and barking demands were characteristics of bullying? Connie said that although she knew she could come across as abrasive, she justified her behaviors as “for the good of the patient.” For 30 years, Connie was known as a bully, but it wasn’t until she was able to self-reflect and recognize her behaviors during the workshop that she made the decision to change her behavior. If we’re going to finally put an end to the rampant incidents of bullying and incivility within the nursing profession, we each need to take a hard look in the mirror. Not all disruptive behaviors can be labeled as bullying, so nurses need to understand what bullying is and what it isn’t. But keep in mind that all acts of disruptive behavior in healthcare settings—whether it’s bullying or incivility—aren’t acceptable and should be addressed. For a behavior to be considered bullying, you need a target, the behavior must be harmful in some way, and it must be repeated over time. For example, suppose that an experienced nurse, for whatever reason, doesn’t like a newly hired nurse. She openly criticizes her, refuses to help her or take report from her, and withholds information during shift report. The experienced nurse treats all of the other new nurses as professional colleagues. This is bullying. Incivility includes being rude, inconsiderate, and disrespectful. It shows up as gossip, condescending body language, helping the people you like, and not helping the people you don’t like. It’s the eye rolling, mocking, and clique-like behavior too often seen in workplaces. Although bullying is typically addressed through workplace policy and codes of conduct, incivility is addressed through culture change. As I work with healthcare leaders to cultivate a healthy, professional, and supportive workforce by addressing workplace bullying and incivility, I’ve learned that the bullies can’t be “everyone else.” If over 90% of new nurses report witnessing or experiencing bullying behavior, we all have to look in the mirror and determine if we might be the bullies or at least, in some way, contribute to an uncivil work culture. Start by taking an introspective look at your behaviors using a self-assessment tool, like the one I created. (See What if the bully is you?) Complete the assessment honestly and identify areas where you may be contributing to an unprofessional work environment. This assessment tool hasn’t been validated, but it provides a quick and easy opportunity to self-reflect. For a validated, more comprehensive assessment, consider Dr. Cynthia Clark’s Workplace Civility Index (bit.ly/2Tu2k3k). What if the bully is you? If you answered “sometimes” or “frequently” to one or more statements, you’re displaying behaviors that could be considered bullying if repeated over time. Remember, the first step to success is self-awareness. The second step is changing your behavior. Answering “sometimes” or “frequently” to many of the questions on the “What if the bully is you?” assessment may indicate a pattern of disruptive behaviors that could be defined as bullying. This may come as a shock, or you may already know that some of your behaviors are unprofessional. Remember that there are levels of disruptive behavior; if you answered “frequently” to some of the questions, you may be exhibiting low-level (incivility) behaviors. Whatever the level of your behavior, you need to make a change. And recognizing the need to change is usually the toughest part. After you complete the assessment and identify that you’ve behaved unprofessionally, regardless of the reason, you now have an opportunity to step up and choose to conduct yourself professionally. I read this story a few years ago about a man who was curious about who the “mean guy” was in the neighborhood: People were always talking about this mean guy who lived on our block. I decided to go see for myself. I went to his door, but he said he wasn’t the mean guy; the mean guy lived in the house over there. “No, you stupid idiot,” I said, “that’s my house.” It may be difficult and uncomfortable to open yourself up for scrutiny and awareness of your own behaviors, but such openness is a quality of maturity and professionalism. Admit to your coworkers that you recognize you haven’t always treated them professionally and that you intend to change. Ask them to be honest and direct with you if they see you behaving unprofessionally or uncivilly. Tell your coworkers, “If I ever come across as_________, please let me know because I really want to improve.” The key here is that when someone does call you out on your behavior, you need to be open to it and refrain from being defensive. Reacting defensively to the feedback will reinforce a culture of silence. Ask your supervisor for honest feedback, too. Don’t assume that just because your supervisor hasn’t talked to you about your behavior that your coworkers’ complaints are unwarranted. Many managers and supervisors struggle to have difficult conversations with staff. Bringing it up yourself may be just the opening your supervisor needs to have an honest discussion with you. If you recognize bullying behavior in yourself, avoid spending excess energy on guilt and self-deprecation. Nurses who bully don’t always make a conscious decision to treat their coworkers poorly. Sometimes they adopt bullying behaviors to cope with the demands of the job, protect themselves from others, or because they have personal issues that are spilling over into work. To that end, don’t be afraid to seek professional help to achieve the changes you’re striving for. Most healthcare organizations offer some type of employee assistance program, which may be no or low cost. You also can find a trusted mentor, someone who will give you honest feedback and offer you suggestions about how to adapt your behavior. There’s no shame in realizing you’ve been behaving asa bully; the shame lies in realizing you’re a bully and doing nothing about it. If you’ve openly criticized co workers or made fun of another’s mistake, make a vow that you won’t behave that way again. When Connie admitted she was the bully and her assistant manager and charge nurse finally had the courage to agree, she cried, they cried, we all cried. The entire room of 75 people applauded her, not because she was the bully, of course, but because she was able to finally see herself through other people’s eyes. She vowed, in front of everyone, that she would do everything she could to change her behavior. And she did. You can’t fix something if you don’t even know it’s broken. We’re losing great nurses to bullying and incivility. Everyone has to do his or her part to stop the cycle of nurse bullying—even the bullies. If you’re a nurse manager, consider printing the “What if the bully is you?” assessment and asking the entire staff (nurses, nursing assistants, unit secretaries, and others) to complete it. This is a self-reflection exercise, so don’t ask to see the completed assessments. The goal is for each staff member to recognize his or her disruptive behavior and change it. How can everyone in the department support and nurture new employees? How can we refrain from being too hard on new staff? How can each of us make an effort to help new employees succeed? Renee Thompson is the CEO and founder of the Healthy Workforce Institute in Pittsburgh Pennsylvania (email: renee@rtconnections.com). She’s also the author of the book “Do No Harm” Applies to Nurses Too! ANA Enterprise. Healthy Nurse, Healthy Nation™ Year One Highlights. Am Nurs Today. 2018;13(11):29-38. Boivin JM. 2018 nursing trends and salary survey results. Am Nurs Today. 2018;13(11):14-9. Clark CM. Creating & Sustaining Civility in Nursing Education. Indianapolis, IN: Sigma Theta Tau International; 2013. Gilbert RT, Hudson JS, Strider D. Addressing the elephant in the room: Nurse manager recognition of and response to nurse-to-nurse bullying. Nurs Adm Q. 2016;40(3):E1-11. Kusy M, Holloway EL. A field guide to real-time culture change: Just “rolling out” a training program won’t cut it. J Med Pract Manage.2014;29(5):294-303. Stewart KR, Hand KA. SBAR, communication, and patient safety: An integrated literature review. Medsurg Nurs. 2017;26(5):297-305. Xu T, Magnusson HLL, Lange T, et al. Workplace bullying and violence as risk factors for type 2 diabetes: A multicohort study and meta-analysis. Diabetologia. 2018;61(1):75-83. Thank you for your thoughtful comments. Addressing workplace bullying and incivility is top of mind for almost every healthcare leader. However, eliminating disruptive behaviors must first begin with each one of us, looking in the mirror to see the role we each play. It takes courage but necessary! Great article. I wished this was a discussed topic 35 years ago when I first entered nursing. I was a new grad in an NICU and honestly, was ready to quit nursing totally because of my experience with major bullying. I had to stay because as a young single mother, I could not repay the moving expenses they gave me to move there. I had a similar experience 20years later starting new in a PICU. They only thing that kept me sane then, was reading back over portfolios and other accomplishments that reminded me of who I really was. Anyone orienting new staff especially, should have to go through some kind of screening as such. My first reaction after reading this article was “wow, I feel like I know some of these nurses!” I wanted to thank you for featuring this article and speaking out about such a serious problem that is seemingly becoming an epidemic in nursing. After reading, I was interested in doing more research on this unflattering topic. I found an overwhelming amount of literature discussing the prevalence, causes, effects and prevention of these bullying behaviors. In her article “Nurse Bullying: Stand up and Speak Out,” Kathleen Colduvell says that 85% of nurses will experience bullying at some point in their career and goes on to say that 60% of new nurses leave their first positions within 6 months because of being bullied. This is so disheartening because nurses are caring and kind people. We treat our patients with respect and compassion, yet we are bullies to our coworkers. I work in a department where several nurses have reported bullying behaviors and have since left the unit. We are currently going through education and trying to promote a more positive culture. Our department also has very poor employee engagement scores right now. I would say those two go hand in hand. I plan on taking the article by Renee Thompson back to my department manager to see if we can discuss this during a staff meeting. The self-assessment tool in the article was very eye-opening and really makes the reader look inside and evaluate their own actions. 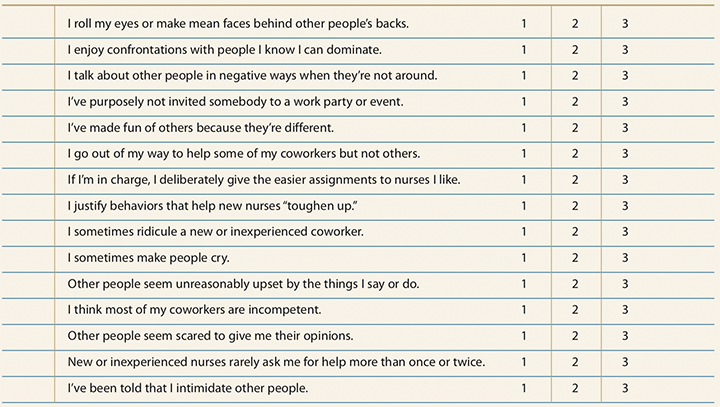 I think that many nurses will come to realize that they have exhibited some of these behaviors. Thank you for publishing this article and providing such eye-opening information about bullying in nursing. Hopefully, after more people read this and other articles, we can start making positive changes and take better care of each other. There really is no need to add stress to an already stressful and difficult job. I look forward to seeing how this article helps my department. As an emergency room charge nurse, I have witnessed bullying between nurses throughout the years. I agree with the article that we all need to be self-aware, request honest feedback, and we all need to do our part and improve our actions. I am writing this letter to voice my opinion on the topic, identify any limitations noticed, and give a recommendation for improvement. This article was an eye opener of all the different types of bullying that are out there and defining the difference of bullying and incivility. The ANA Enterprise (2018) offered good advice that each individual should focus on taking care of themselves and encourage others to do the same to reduce stress to try and decrease while avoid bullying in the workplace. Being aware is extremely important and humbling. The only limitation noticed was the survey results that was created. The survey gives individuals the insight that they do have an issue at hand, but it does not seem specific. I recommend having a more specific survey on feedback. The comprehensive assessment to complete was helpful. I found an article that mentioned living the art of “humanbecoming.” In the article by Condon (2015) it mentioned that nurses in the leadership role need be open to new ideas and non-judgmental. I think this is a recommendation to be passed along while remembering what will reduce a bully free atmosphere when recognized. Great two examples given, and bullying takes many shapes and forms. It is important to recognize bullying and realize it’s inappropriate and unprofessional, and to be aware if you are the issue and fix it. The nurse manager tip that you had given about giving each staff member the survey and have them personally reflect on the results is a great idea. I would like to implement this on my unit to see if any change would come out of the outcome. I also recommend during staff meetings to have a constructive criticism time while voicing areas of concern. This may help staff realize their actions in a safe area and try to work on the negativity. Your January 2019, vol 14, number 1 article titled “What if you’re the bully?” was a brilliant read and an eye opener to all nurses across the globe. The author patiently captured the workplace menace that could impact how nurses function and provide high quality nursing care if bullying is not curbed. Most importantly, it could jeopardize patient experience and overall desired outcomes. In my personal opinion, managers could go a step further to introduce the self assessment tool during new hire orientation. It could also be introduced during unit council meeting to generate a healthy conversation that could shed more light to the magnitude of the problem. Or, perhaps, we should all be bold enough to take Dr. Cynthia Clark’s Workplace Civility Index Assessment Tool to determine where we all stand as front line staff, nursing leadership, or as independent providers with licenses. Besides, the assessment tool has a larger goal to achieve that was not highlighted. That is, to make us better individuals not only at our workplaces, but at home fronts and in our communities.